With its lower price and substantial benefits, SaaS adoption is skyrocketing. But, what is SaaS all about? 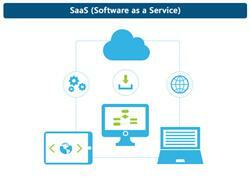 Software as a service (SaaS) is a key factor in the cloud computing ecosystem. SaaS users can rent or subscribe to a software application and execute it online instead of purchasing it to install on in-house computers. The cloud hosting provider installs operates and maintain the type of software required application on behalf of the company. Due to this the installation and maintenance costs associated with IT platform or infrastructure are reduced. The software can be accessed from any device or platform. By deploying SaaS solutions, service provider moves away from the complexity and rigidity associated with traditional on-premises IT infrastructures. A service provider uses public cloud resource to create their private cloud, which results in a virtual private cloud. The goal of cloud computing is to provide scalable and easy access to computing resources and IT services. SaaS is one of the methodologies of Cloud Computing, based on a “one-to-many” model where an application is shared across multiple clients. SaaS is going to have a major impact software industry, as a service will change the way people build, sell, buy, and use the software. Today, business decision makers mostly prefer pay-as-you-go models, and SaaS solutions offer a model that’s aligned with this preference, making it easy for service providers to package their services accordingly. SaaS delivers new services maximum staff and resource efficiency. Maintaining an on-premise infrastructure is not easy. Activities like procuring, architecting, deploying, provisioning, scaling are involved which requires significant time effort and expertise. Today, SaaS applications are expected the advantage of the centralization through a single-instance, multi-tenant architecture, and to provide a feature-rich experience competitive with comparable on-premise applications. A typical SaaS application is offered either directly by the vendor or by an intermediary party called an aggregator, which bundles of a unified application platform. The long term success of service providers will be predicated by their capability to support digital transformation journey of the customers. By using SaaS solutions to power there new services providers can quickly respond to these changing requirements and minimizing its costs and risk.